When cavities are small, fillings are necessary to help keep the tooth decay from spreading. 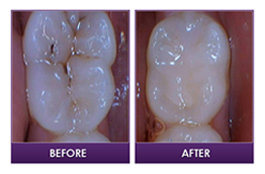 If the cavity is large or affects several of the tooth surfaces, then a crown may be necessary. A crown covers the entire tooth like a cap while a filling covers a smaller portion of the tooth. 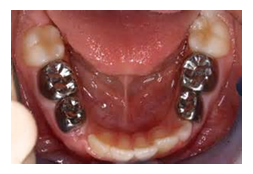 Fillings and crowns may be white or silver. A white filling is called a composite filling. These fillings are designed to match the color of the tooth. White fillings may not be strong enough in certain situations and they do cost a little more so in those cases the stainless steel crowns are a best option. If a tooth falls out due to injury or decay, a space maintainer may be needed to hold the place of the tooth. If a space maintainer is not put in the vacant space the surrounding teeth can crowd and take over that space. This makes the permanent tooth come in crooked or crowded which can cause difficulties in chewing and talking. 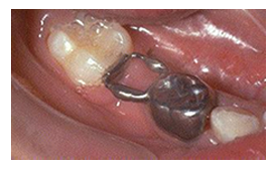 A space maintainer can be a band or crown attached to another tooth. 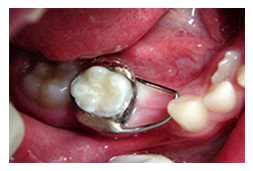 When the permanent tooth starts to grow in, the dentist can remove the space maintainer. Some children are given nitrous oxide, or what you may know as laughing gas, to relax them for their dental treatment. Nitrous oxide/oxygen is a blend of two gases, oxygen and nitrous oxide. Nitrous oxide/oxygen is given through a small breathing mask which is placed over the child’s nose, allowing them to relax, but without putting them to sleep. The American Academy of Pediatric Dentistry, recognizes this technique as a very safe, effective technique to use for treating children’s dental needs. The gas is mild, easily taken, then with normal breathing, it is quickly eliminated from the body. It is non-addictive. While inhaling nitrous oxide/oxygen, your child remains fully conscious and keeps all natural reflexes. Your child may feel like is floating and his/her hands may fell tingling during the time under the nitrous and he/she will be back to normal as soon as we turn off the nitrous. Sometimes a form of sedation is the best option for children. We offer all levels of sedation on-site including nitrous oxide, oral conscious sedation and general anesthesia. Our Dentist uses different types of sedation according on your child’s needs. Conscious Sedation is recommended for apprehensive or anxious children, very young children, and children with special needs. It is used to calm your child and to reduce the anxiety or discomfort associated with dental treatments. Your child may be quite drowsy, and may even fall asleep, but they will not become unconscious. There are a variety of different medications, which can be used for conscious sedation. The doctor will prescribe the medication best suited for your child’s overall health and dental treatment recommendations. All staff members who work with your child are CPR certified and use pulse oximeters, heart rate monitors and blood pressure monitors to ensure your child is in excellent care throughout his or her sedation appointment. Outpatient General Anesthesia is recommended for apprehensive children, very young children, and children with special needs that would not work well under conscious sedation . General anesthesia means your child will be completely asleep. The treatment is performed in a hospital or outpatient setting only. While the assumed risks are greater than that of other treatment options, if this is suggested for your child, the benefits of treatment this way have been deemed to outweigh the risks. The inherent risks if this is not chosen are multiple appointments, potential for physical restraint to complete treatment and possible emotional and/or physical injury to your child in order to complete their dental treatment.